With more than 80% of internet traffic referred by search engines, and 90% of users not looking past the first 30 search results; you can see why search engines are the most important source of traffic for websites. If you’re like most, your company has a website, Facebook and LinkedIn page and perhaps a Twitter account. Are these avenues driving potential business to your company? Are you getting the traffic you hoped to receive? Search Engine Optimization is a time consuming, ongoing process, and expensive process. Partly due to the highly complex algorithms created by the major search engines such as Google and Yahoo in order to present end users the most relevant search results. 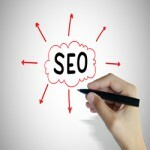 How can Navistra help my website achieve better search engine rankings? All search engines crawl websites searching for keywords, freshness of content, and important connections between pages, better known as links. This process determines how your website will rank on search engines. Making your site user friendly, with informative information visitors are looking is the best route for achieving high search engine rankings. Call us toll free at 1.800.631.3822 or send us an email contact form. We’ll be happy to answer your questions or provide additional information on our services and products.